A filter is a set of criteria that define which objects should or should not be displayed in a panel. Normally, AB Commander displays all objects of the folders in its panels, according to the system-wide settings (controlled by the Folder Options command of Windows Control Panel). However, AB Commander lets you further restrict the set of objects shown in the panels. 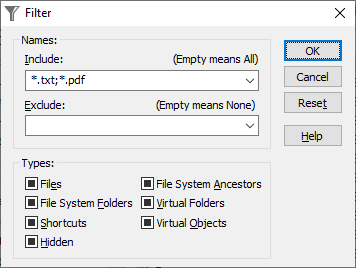 AB Commander lets you also specify more complex filters that you can use to include or exclude several file sets, as well as virtual folders, etc. To set up such a filter, use the Set Filter command on the Panel menu. where the # sign indicates that there is complex filter applied to the file listing. To remove such a filter, use the Panel - Remove Filter command, or simply erase the # character from the title bar with the Folder - Jump command.